Today is Ringo Starr's 70th birthday. And he has a message for all his fans. Peace. That's right, he is still carrying the torch for Peace and Love. At noon today he is asking everyone, everywhere to point their fingers skyward as a gesture to Peace. Seems futile and silly to some, but count me in! In a quote from an interview in New York yesterday, Mr. Starr had this to say about today's event, which is a much needed continuation of John Lennon's "Give Peace A Chance" campaign of almost 40 years ago! "Yes, I want to spread the word that at noon, wherever you are — in New York, in L.A., in Paris, in London — I just pray that you’ll put your fingers up and say, “Peace and Love.” I did it two years ago, it was the first time, and I did it out of Chicago because I was on tour. This year, we’re playing Radio City, so we’re doing it in New York. In Japan there were little get-togethers and it went worldwide, so that was great." 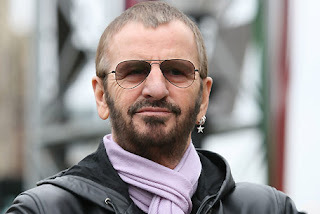 Ringo was born Richard Starkey during the Battle of Britain in the summer of 1940. His first 5 years of life were spent living with war. The irony of that is inescapable. Most of his early years were spent in the hospital. These two factors probably helped to make him the gentle soul that he is, and undoubtedly contribute to his wish for World Peace. He was playing drums with Rory Storm and the Hurricanes when he was asked to join the Beatles in late 1962, just as they were about to record their first record, "Love Me Do", on Parlophone Records. He replaced Pete Best. The rest is history. Ringo is still out there with his All "Starr" Band and touring. Sue and I saw him several years ago and everyone left that concert smiling, with a little help from their friends. Here's a little video that Mr. Starr did after the death of his friend and former bandmate George Harrison a few years ago. Hope you enjoy the video and don't forget to raise your fingers at noon today, wherever you are. Give Peace a Chance!